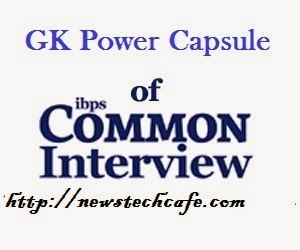 Dear Readers Today we are Sharing Top 10 Most important IBPS Bank PO 2015 interview questions. These question are created by one of our User MR. Shobhit Aggarwal for our newstechcafe.com readers. Please Follow them carefully to get succeed in IBPS PO interview held in 2015. Definition: - An Initial Public Offering is the first sale of stock by a company to the public. A company can raise money through IPO by issuing either debt or equity. Every year new IPO are launched in India. The Dutch East India undertook the world’s First IPO and therefore became the first public company to issue stock. Definition: - India was one of the first in Asia to recognize the effectiveness of export Processing Zone (EPS) model in promoting exports, with Asia’s first EPS set up in Kandla in 1965. The special economic Zone policy came into inception on 1 April 2000. The Prime Minister objective to enhance foreign investment in India and provide internationally competitive and hassle free environment for exports. Definition:- LAF is monetary tool by which banks borrow money through repurchase agreement .LAF is used to aid banks in adjusting day to day activities. LAF consists of repo and reverse repo rate. Definition: - An investor or investment fund that is from or registered in country outside of the one in which it is currently investing. 2. FII are those Institutional investors which invest in the assets belonging to a different country other than that where organization are based. Definition:- The ECGC limited was established on 30 july 1957 with a an objective to provide insurance cover in respect of risks in export trade. The risk related with loss of money due to buyers bankruptcy and sudden changes in rule of import and exchange restriction in stopping of payments. Definition: - Current account is used for business activities. Sole proprietor, public company, private company are eligible to open account of current account. Interest is not paid on current account. Saving Bank: - Any individual who saves their money for fulfilling daily needs and getting good return on their deposits. Interest rate is deregulated by RBI and is based on daily basis. Ans: - The ability of assets to be converted into cash quickly and without any discount is called Liquidity. Ans: - Shares and securities are held electronically in a dematarlised form instead of the physical form is called Dematarilisation. Banks has to keep its reserve with RBI on daily basis is called CRR. It is one of the major tools of monetary policy which is made by RBI. Currently CRR -4%.